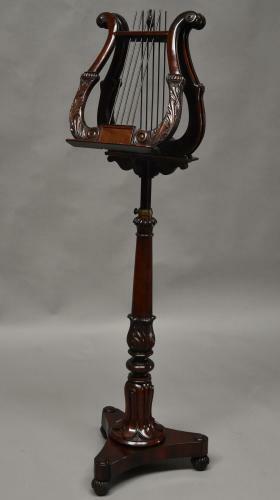 This duet stand consists of two finely carved adjustable lyre supports with applied paterae to the top, gadrooned carving with scrolling leaf decoration below with central panel of fine curl mahogany, both supported by a central fixed lyre. Each lyre consists of brass rods to give the appearance of strings, the central lyre having a turned finial to the top. This leads down to a turned and carved adjustable column supported on a tri-form base with applied paterae decoration terminating with gadrooned and turned feet. This piece is in very good condition for age, is of stable construction and can go straight into a home etc.